What if you had a "Wayback Television Set" and could watch an entire month of ancient prehistory unfold before your eyes in real time? David Rubin of the U.S. Department of Energy's Lawrence Berkeley National Laboratory (Berkeley Lab) presented just such a scenario to the American Astronomical Society (AAS) meeting in Long Beach, CA, when he announced the discovery of a striking astronomical object: a Type Ia supernova with a redshift of 1.71 that dates back 10 billion years in time. Labeled SN SCP-0401, the supernova is exceptional for its detailed spectrum and precision color measurement, unprecedented in a supernova so distant. "This is the most distant supernova anyone has ever found for doing dependable cosmology," says Rubin, a member of the international Supernova Cosmology Project (SCP) based at Berkeley Lab. "The most important unanswered question we have about the nature of dark energy is whether it varies over time -- whether it affects the expansion of the universe differently in different eras. With SN SCP-0401, we have the first example of a well-measured supernova sufficiently far away to study the expansion history of the universe from almost 10 billion years ago." The SCP is headed by astrophysicist Saul Perlmutter, a faculty senior scientist in Berkeley Lab's Physics Division and a professor of physics at the University of California, Berkeley, who puts it this way: "Imagine you're channel surfing and you come across live news coverage of an exploding star -- and then you see the dateline that says it's July 22nd, 9,947,989,219 BCE! By August 9 the supernova is at its brightest and starts to fade, but you get to watch the whole thing -- even though, before the news could ever reach your TV, our solar system had to form, and then our planet, and intelligent life had to evolve on Earth." Live-at-the-scene coverage has special advantages. While the light curves of most supernovae with redshifts above 1.5 are either incomplete or not cosmologically useful, because their colors can't be accurately measured, our imaginary Wayback TV broadcast, says Perlmutter, "has enough high-resolution information to allow us to confidently compare this ancient supernova with much more recent astronomical events." Wayback TV is imaginary, but not SN SCP-0401's high-resolution details. The SCP's analysis of the new supernova will appear in the January 20, 2013 issue of the Astrophysical Journal. Most supernovae begin as stars whose cores collapse, but a Type Ia supernova, in the simplest model, begins as a white dwarf star borrowing mass from a companion star; when it reaches critical mass, it erupts in a titanic thermonuclear explosion. 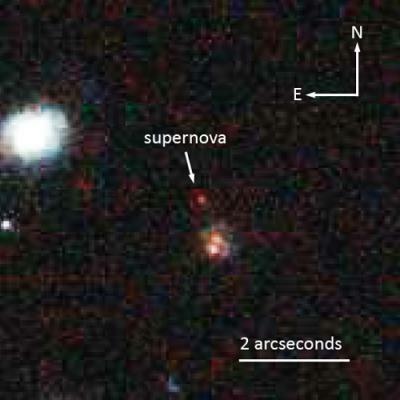 While not identical, Type Ia's are more similar in brightness than any other type of supernova, and their variability can be accurately corrected for comparison. This makes them excellent "standard candles" for measuring cosmic distances -- the dimmer they appear, the farther away they are, and their distance can be confidently measured. At the same time, their redshift is a direct gauge of how much the universe has expanded since the supernova exploded. Measuring the history of expansion ultimately depends on comparing distance and redshift for enough Type Ia's over a long expanse of time; this is how accelerating expansion, propelled by dark energy, was independently found by two competing teams and announced in 1998. For this discovery, in 2011 Saul Perlmutter divided the Nobel Prize in Physics with Brian Schmidt and Adam Riess of the competing High-z Supernova Search Team. "We were looking for supernovae so far away that they really required the HST, not just to detect them but so we could separate them from their host galaxies, in hopes of getting clean spectra," says Rob Knop, now of Quest University Canada, who headed the SCP's search strategy in 2004 and wrote the software that identified likely candidates. Following an SCP tradition of nicknaming candidates after composers, Knop and colleague Rachel Gibbons, both then at Vanderbilt University, named the new contender "Mingus" after the jazz composer. Mingus was so distant it skirted the edge of invisibility, like trying to see a firefly all the way across the United States. And it was red -- possibly its intrinsic color but more likely due to very high redshift; only with an accurate spectrum could the researchers tell for sure. Initial spectra were captured by the Hubble's Advanced Camera for Surveys (ACS), equipped with a grism (a combined diffraction grating and prism) that collects light from the target object and from nearby objects as well. "The ACS grism data suggested the most likely match was a Type Ia supernova at redshift 1.7 -- very distant and very old -- but by itself the ACS could not establish the spectral features which could confirm this," says SCP member Andrew Fruchter, of the Space Telescope Science Institute. The problem was solved when a different grism-equipped camera, the Wide Field Camera 3 (WFC3), was installed on the Hubble in 2009. When David Rubin saw the data he realized that the WFC3 had luckily caught some of the spectrum of Mingus's host galaxy. Fruchter says, "The new WFC3 data pinned down the host's redshift at 1.713 -- a match to the first estimate for Mingus." He adds that "each new instrument on HST has enabled new discoveries. 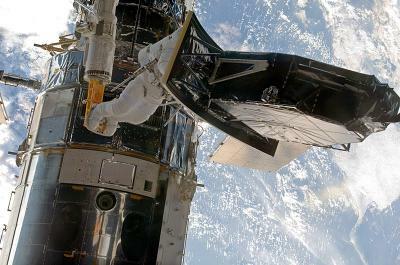 It's exciting to see the Hubble continue to make breakthroughs even as we are building its successor." To confirm that far-away Mingus really was a Type Ia, Rubin derived a spectrum model that allowed him to compare its spectrum with published spectra from other Type Ia's, as well as from core-collapse supernovae, as these objects would appear at redshift 1.713. The best-fit Type Ia spectrum was an almost perfect match with Mingus's spectrum. With Rubin's model indicating an over 90-percent chance of its identity -- a conservative estimate, at that -- Mingus was confirmed as a Type Ia and with confirmation got its more official-sounding designation, SCP-0401. "To be able to directly compare different Type Ia supernovae, we have to fit their light curves -- the time it takes the supernova to reach maximum brightness and the time it takes that brightness to fall off," says Rubin. "We also have to be able to compare the brightness of the different colors during this process, in order to calibrate the supernova." Perlmutter remarks that such calibration "can be a lot like trying to match a particular shade of housepaint when you've got a thousand color chips to compare, maybe more." In this case, calibration meant finding exactly the right shade of red. Both the ACS camera and the Near Infrared Camera and Multi-Object Spectrometer (NICMOS), also carried aboard the Hubble, measured SCP-0401's apparent brightness in different colors over time. The cosmological picture from SCP-0401, a single distant data point, begins to sharpen our measurements of dark energy's possible time variation. This is the first step toward the precision measurements that will require observations of many more Type Ia supernovae as far away as SCP-0401. Says Rubin, "Hubble is our best bet to find and measure similar distant supernovae. Luckily Hubble has a few good years left." "Precision measurement of the most distant spectroscopically confirmed supernova Ia with the Hubble Space Telescope," by David Rubin, Rob Knop, Eli Rykoff, Greg Aldering, Rahman Amanullah, Kyle Barbary, M. Shane Burns, Alex Conley, Natalia Connolly, Susana Deustua, Vitaliy Fadeyev, Hannah Fakhouri, Andrew Fruchter, Rachel Gibbons, Gerson Goldhaber (deceased), Ariel Goobar, Eric Hsiao, Xiaosheng Huang, Marek Kowalski, Chris Lidman, Josh Meyers, Jakob Nordin, Saul Perlmutter, Anthony Spadafora, and Vallery Stanishev -- The Supernova Cosmology Project -- will appear in the January 20, 2013 issue of the Astrophysical Journal and is currently available as a preprint on arXiv at http://arxiv.org/abs/1205.3494. This work was supported by the U.S. Department of Energy's Office of Science.